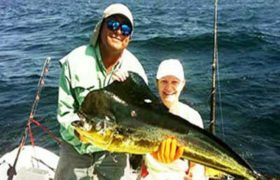 Dorado are also referred to as Mahi Mahi and the dolphin fish. Best action starts with the rains, beginning in late May – October when the debris and drift wood flow from the river mouths and creates an inshore trash line that Mahi love. This fish is exciting to catch on light tackle and distinguished by their brilliant colors ranging from greens to blues with brilliant iridescent. Once they are removed from the water, the fish gradually fades to yellow-gray. Males, also referred to as bulls, have a square forehead while females have a more rounded head and are generally smaller. Dorado can reach the length of length of 6 feet and weigh more than 50 lbs., but are normally 25. Excellent eating fish. Marlin and Sail are in the North Pacific Coast during the months of May – November which is this areas rainy season. These billfish put up a powerful fight that can last for hours, so be prepared to be tired when you’re done reeling one in. Sailfish “light up” when excited and become brilliant iridescent blue, purple with a silver belly. It is thought that their ability to change colors serves as a form of communication with other sailfish. 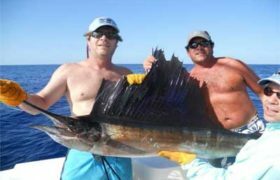 Sail and Marlin are considered the most prized fish by all anglers because of thier power, fight and size – weighing close to 800 lbs and can grow up to 14 ft. in lenght. Females outgrow the males and are considered the Trophy catch. Catch and Release. 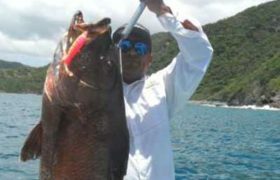 One of the most sought after game fish of Costa Rica’s Papagayo Gulf. The gorgeous dorsal fin on the Rooster Fish is distinctive with its fanlike fin when it is excited which gives the fish its name. Rooster fish are found inshore, rock formation, along the surf and over sandy bottoms and prefer moderate depths, feeding on small fish. When hooked, the Rooster will raise its dorsal fin like a flag and this fish makes an exciting catch. These fish can be hooked with poppers and spinners, though they go crazy for live bait. Catch and Release. 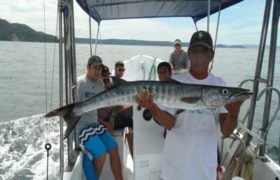 The wahoo travel in small schools, found inshore and occassionally offshore, they prefer rocky points and islands to open ocean. Wahoo are in the area during the months May – August which is during our rainy season. Wahoo are sleek, dark-blue, elongated fish with an iridescent green-blue back and a pattern of blue vertical bars. A fierce fighter and reported to be one of the fastest fish in the ocean. Wahoo are extremely difficult to catch, put a serious fight. Excellent for eating. These fish are in the area all year round and the crew knows where to go for these fish. 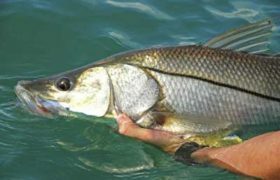 Fished for in shallow, rough waters 3-10 ft., and inhabit tidal estuaries and river mouths flowing into the ocean. They are another bass type fish, ambush predators which lay in wait for a bait fish to swim by. They can be caught on poppers, jigs, rapallas, and live bait such as sardines and mullet. They make for excellent eating. 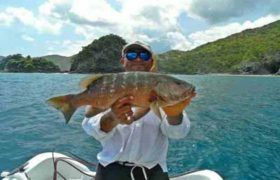 There are many types of grouper in the Papagayo Gulf. These fish are generally found in areas with rocky bottoms, shoreline and at depths of 100 feet. 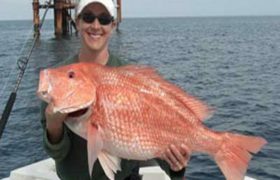 Grouper can be caught on live bait, sardines or Ballyhoo, or jigs round rock formations at the depths of 50 to over 400 ft deep. Excellent eating. 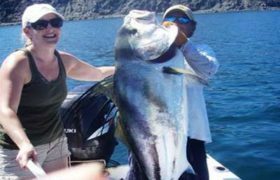 There are several species of jacks which inhabit Costa Rica’s Pacific waters: Jack crevelles, Horse-eye Jacks and trevally’s are some on the most common ones caught inshore fishing. They are strong fighters especially on light tackle, live bait, jigs, poppers, or lures. Amberjacks are the largest of the jacks weighing around 40 lbs. These fish are vicious predators and are caught in 25 feet of water, near floating objects. Not good for eating. Corvina’s are found inshore around rocks, river mouths, or in tidal estuaries and can grow to a larger size. These fish are similar to sea trout which can be found in the Gulf of Mexico but grow larger. Good eating. Spanish Mackarel can be caught inshore with live baits, trolled lures, spoons, jigs and poppers. These fish can weigh from 3-15 lbs. Good eating. Jack Crevalle’s are silver with a yellowish belly and have a black spot on the gill cover and a black spot at the base of each pectoral fin. These fish range in weight from 5 – 30 lbs. Catch and relase – not good for eating.